Apple pancakes: Add a cup of chunky applesauce and a teaspoon of cinnamon to your favorite pancake batter. Top cooked pancakes with maple syrup and toasted walnuts. 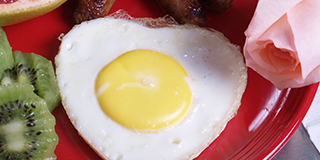 Heart eggs: Using a heart-shaped cookie cutter, cut out the center of a slice of whole- grain bread. Spray both sides of bread with cooking spray and place in a frying pan over medium heat. Crack an egg into the center hole, cover the pan, and cook until done as desired. This entry was posted in All Blogs, CORE Wellness and tagged ACI Specialty Benefits, applebyte, brunch ideas, core wellness, corporate wellness, Employee Assistance, employee assistance programs, employee benefits, Health & Wellness, mother's day, mother's day brunch, Top-Ten EAP, Wellness. Bookmark the permalink.